Puzzle Pirates Forums - View Thread - Alt accounts that are taking over oceans. Forums » List all forums » Forum: Game Design » Thread: Alt accounts that are taking over oceans. 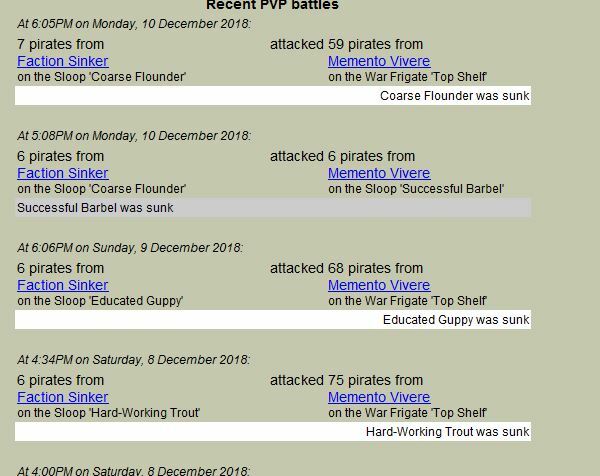 Hello, since I've been away for a while and I see this new event (which is pretty much a copy/paste version of the last one) As of this time I have seen people using 15-20+ alts on a ship while doing them (not stating what ocean or pirate because its irrelevant). Do you think this is an abuse of the system? The Swabbie change made this been able to abuse? Does it make these events completely irrelevant where you can use 20 alts to straightline to win IOs? In Spirit of the game is alt usage bad for the game? With alts is it a way to bump up the population numbers to attract more players which really does nothing to the NB? What would the OMs say about this big usage of alt abuse? I have often thought that the mass amounts of alts hurts the game. What your describing is no worse then sinking your own alt and they are ok with that. It hurts the game, people hide behind them to pvp a factions evade war ect... Provide labor for there own shops instead of hiring people. Is it good bad, is complex but I am sure it wont be addressed. Yep. Maybe make the event trinkets non-tradable for now on to prevent the abuse like PvP trinkets. Most likely will be hidden, since yeah people alt all the time I understand that, but 15+ alts? its against spirit of the game in my opinion. What your describing is no worse then sinking your own alt and they are ok with that. Ignore the +1 above this post. 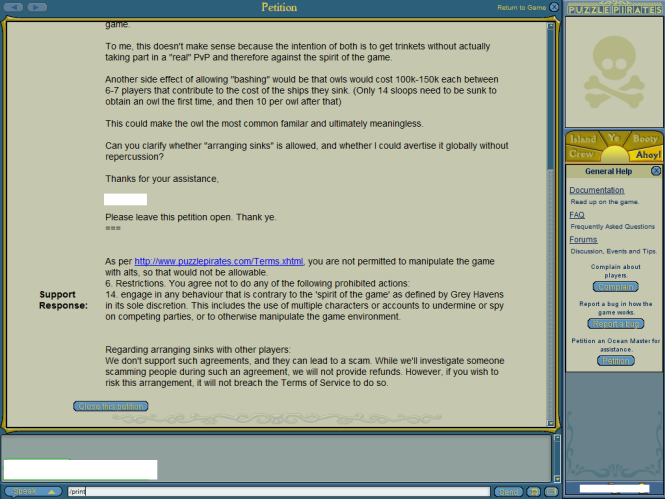 You were actively involved when Self-sinking and Arranged pvp were hot topics on Obsidian. You should know they are certainly not "ok with that". I don't believe there's been any word about the use of alts for the current competition, strangely enough. So.. make of that what you will. LOL odd they are advertised on global chat regularly. Even have crews named for it. Hi Filthyjake, those are my crews, and my faction events, except for the war frigate which i borrowed from Top Shelf. It brought a lot of happiness to the ocean especially those that were finally able to get their first familiars. We get it, you have a thing against just about everything, but certain things do make some people happy. The system is extremely flawed, and there are a lot of loopholes people have to jump through to get things legitimately, and no one has the time to start looking for 30 other ships with bounties to sink off just to get 1 trinket. When we try to do legitimate pvps, people still b*tch and moan, hell there's another active thread that was started as a result of a PvP. So yeah, people are going to do whatever they have to to experience parts of the game that they otherwise will probably never have access to. I understand, that and gave up on it but the statement ryuken made saying its not ok is laughable. Thats all not an attack on you or anyone. I am aware of the issue and the love of the lazy fams sadly it makes the current war pointless as there is still no reason for the pvped to fight back. Laze on to success its so fun and good for the game. I feel its been too much of a gray area for too long, and something needs ruling about it for massive alt usage. Even botters used to do this in cades from Emerald according to some people on threads accusing flags doing it. Have to agree with filthyjake on this one, lazing to get rewards should not be part of the game to get trophies or trinkets, which is why I've seen players use 15+ alts to do this. At the same point Stan is also correct, with normal PvPs people just play too defensively, unless the board was 8x8 for PvPs like Antix's competition, then you would have actual competitive PvPs. The following post is only about PvP sinks and has nothing to do with the current IO alt-abuse. Everything I mention here is not a fact and is purely from my own experience. If you've experienced something different, please post it below. I was also anti-running arranged pvp'd sinks till I learned the process it actually took to legitimately get a PVP trinket. 1. Icons don't usually show up on ships till after reboot, so if they did their sink on a thursday, you probaboly won't even realize they had a bounty till monday. 2. If you sink a ship with a bounty, the amount of trinkets you get depends on how much the bounty is on your your ship. Unless you're someone actively hunting people down ALOT to get your bounty to 100k+, chances are you'll only be able to get 1 trinket at a time. 3. Voyages are rarely ran on Obsidian, it's hard enough finding somewhere to job for, let alone someone to hunt to get your bounty up. Wanna guess the odds for stumbling on another player vessel at sea that already has a bounty on it? pretty freaking low. 4. You're probably saying "But Stan, a lot of people are at sea, greedy bashing and all, that" - Yeah with extremely undermanned vessels, or are newer officers soloing their ships or running pillages with barely anyone else aboard cos the population is too low to support jobbing. Hell, why would you need to put fill a ship when you can just hire Swabbies to do all your puzzling while you chill in a crows nest. You will have to go out there and hunt down undermanned ships (and have to deal with the "dEcLaRaTiOn oF wAr" posts on the forums that come with sinking another player's boats). You'll also have to pray and hope there are other players out there hunting and sinking undermanned boats that you can sink off to get your trinkets from. You'll most likely have to find and sink about 30-50 other boats to be able to get your Owl if you're able to get 1 trinket at a time. All of which you have to do while hoping your bounty doesn't run out in before you find another player with a bounty since bounties degrade over time. If this isn't a grind. I don't know what is, and I'd estimate it would take someone who is an active legitimate PVP hunter and isn't doing any arranged sinks at all between bountied ships about 5 years to a lifetime to get the 30 trinkets needed for the owl. A regular player who isn't actively at sea for 24 hours hunting ships? probably never. You can't trade trinkets, they can't just buy their owls either, what else are they going to do? I'm not trying to justify feeling the need to arrange a sink to be able to circumvent the PvP system, but it is nearly impossible to get those Owls and Wolverines and other cool stuff with the current system/population climate combined with the overall player-attitude towards PvP sinks. Stan replying on a post with "Alts" in its title, classic. Depiratize yourself and face the puzzleshed! My stand on this, is there needs to be a more clear area where having at least 1 alt is acceptable but having more is against the TOS. Since its way too much of an abuse of the system. "Seal Event is pointless, because people just use 20+ alts on Grand Frigates against sloops." people really care what "team" wins competitions? everyone gets a trophy for participating - does anybody remember that "Emperor's Vintage" means your team did better than the one that won "Imperial Eye Patch" in the 2012 summer event? and unless alts are in your crew they could be on a different team anyway. what in the world would I do with each of the 3 furniture items in all 37 colors and why should I care if someone else does? do I have alt accounts? yes. running a forage ship is boring enough with an alt and it is the only way I can get labor for some of my shops/stalls. I offer competitive wages if anyone wants a job and all are active businesses. as for dead oceans, people play the game for all kinds of reasons and some do not require hundreds of people. while I am sorry Cerulean cannot support Atlantis or HS other than quick hit and run in a sloop, there is still enough to interest me to keep subscribing.